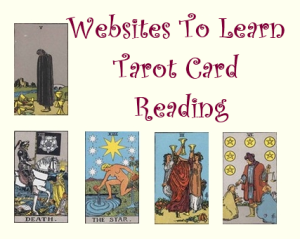 Here is a list of free online Tarot card reading websites to get Tarot predictions. Tarot is popular method of predicting various aspects of life, that can be related to past, present, future, love, relationship, career and more. Some people really believe in Tarot Card Reading. 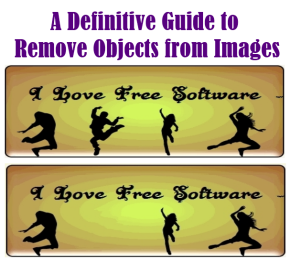 Keeping this is mind, I’ve reviewed some free online Tarot reading websites. Tarot-Live is the online tarot card reading website that offers you free Tarot prediction. The interface of this website offers 3D atmosphere, with soothing musical backgrounds. This relaxing music relaxes your mind, and make you feel good. On the homepage of this website, it provides you various options: Love Tarot, Tarot Yes or Not, Celtic Cross Tarot, and much more. All you have to do is, simply choose the Tarot reading option from the interface and then enter your name, gender, and then choose the card of Tarot. Then it quickly displays set of cards from which you’ve to choose the cards one after the other, until the Tarot starts loading. It’ll soon provide you the prediction, where it tells the significance of the position of the card. Below that, it provides you what each picked card symbolizes, which is pretty good. In addition to online Tarot reading, this website also provides you various method to generate personal astrology profile, for which you can use, Runic Oracle, Moon’s Nodes, Numerology Online, and many more. Not only that, you can also learn the meaning of each Tarot Card. 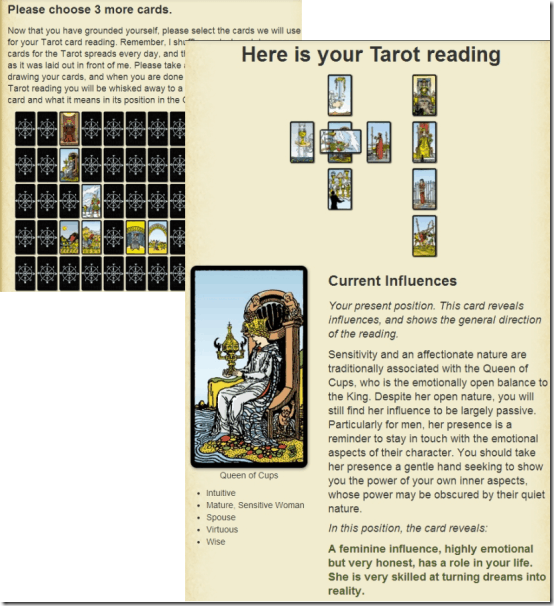 Trusted Tarot is the website that lets you read Tarot card online. To get personalized Tarot reading, you just have to click on the Free Tarot Reading option, available on the homepage of this Tarot card reading website. As soon as you click on it, it quickly redirects you to the page where it offers you an audio mediation exercise, that instructs you to get grounded to earth to feel the mother nature around, and it asks you to repeat some phrases to begin the Tarot reading. Once you’re done, you can click scroll the page down to enter your First name, and Birthdate, for accurate results. Then from the cards you’ve to select 10 cards, randomly. Then soon after selecting the 10th card, it’ll ask you to provide valid email address, where it’ll provide a click to view Tarot results. It provides you significance of each selected card along with the final result. If you need to access this free online Tarot card reading website in future, you need to to register, which is free, otherwise it’ll not display the results when you enter the same email address again. You can also shuffle the cards, to get Tarot reading. In addition to Tarot card reading, this website provides you Tarot Card Meanings, Tarot Cards, and Tarot Horoscope as per your Zodiac sign. Not only that, it also offers you Biorhythm calculator and I Ching reading predictions. It provides Color theory, that gives information related to power of colors. It offers Chinese Zodiac that tells significance of each Chinese Zodiac Animal. It also, offers Yes-No Spread, Three Card Spread, and Money & Career Spreads, but these prediction are paid. 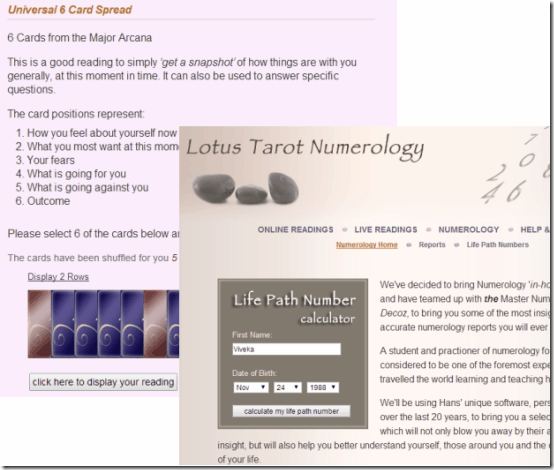 Lotus Tarot is another website that offers you free Tarot card reading. To find your Tarot prediction, you can either register or choose to predict without registration. As soon as you chose to proceed without registration, it quickly redirects you to the page where it offers you 22 cards, from which you have to select 6 cards. Before selecting cards, you can quickly go through the significance of the positions of the cards. You can also display the card as Single Row or 2 Rows. Then soon after selecting the cards, you can click on the button below to check your Tarot reading. 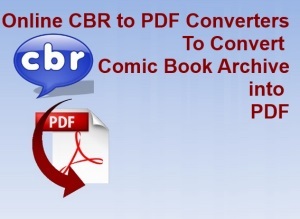 It quickly displays the result that you can save. To save the Tarot reading, you must register with this website (it’s free). In addition to Tarot reading, it also provides you Numerology Life Path prediction calculator, that you can use to check Your Life Path Number. The best part of this online Tarot Card Reading website is that, it offers Lessons that educate you about Tarot Card reading, which is pretty good for those who wish to have basic idea about Tarot Card Reading. 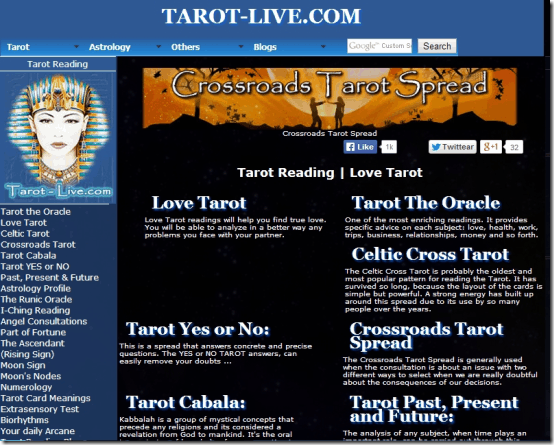 Tarotgoddess is another website that offers Tarot card reading online. 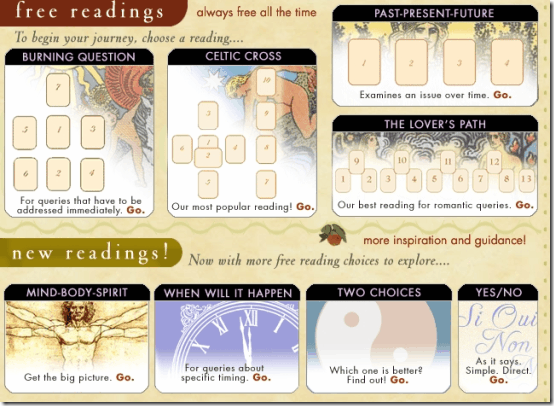 It offers you 8 types of Tarot reading, like: Burning question, Celtic, The Lover’s Path, and much more. Burning Question: Ask question whose solution you want on urgent basis. It fetches total of 7 Tarot cards. Celtic-Cross: This is quite famous in Tarot reading. It provides answer to your questions about your influences, situational, influences, and also about the the past, present & the future. In total, 10 cards will be generated from the deck you opt. Past-Present-Future: It has the ability to fetch results related to your past, present, and the future. It fetches total of 4 cards. The Lover’s Path: Here you can ask question related to your love life, or to fetch a suggestion/solution about current relationship. In total, 13 cards will be generated from the deck you opt. Mind-Body-Spirit:You can access this option to know about yourself along with your alignment with the universe around. It generates 5 cards. When-Will-It-Happen: To get the time probability of any particular task and its time of accomplishment. It generates only one card as result. Two-Choices: This lets you choose between the two choices, giving a result suggesting you which one should you prefer. As result, it generates 5 cards. Yes/No: You can use this option, when you want to decide about proceeding with some task, whether its good doing it now or not. It offers you various decks of cards, like: The Rider Waite, The Goddess Tarot, The Lover’s Path Tarot, etc. from which you can choose the desired set, to proceed to get your Tarot reading. To proceed to get your Tarot reading, all you have to do is simply choose one of the Tarot reading option. As soon as you do that, it quickly asks you to choose a deck of cards for your reading, followed by entering your name and the question you wish to ask. Once you’re done, click on “Get Reading” button. Then soon it provides set of Tarot Cards on the screen, on which you have to click to flip and open to read its significance. It also tells, what each card number symbolizes. Apart from Tarot readings, it offers you Tarot Oracles, like: one card Oracle, yes/no Oracle, Goddess tarot, and much more, whose main purpose is to grant you immediate advice at the moment. 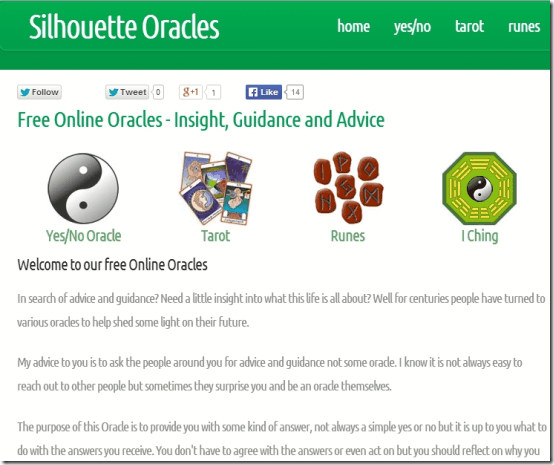 Silhouette Oracles is another online Tarot reading website that provides you results related to your question. To get your Tarot reading, all you need to do is simply select the Tarot from the homepage. As soon as you do that, it quickly redirects you to page, where you can type your question and choose the type of reading from the provided option. Then after selecting the deck, you can click on “Ask the Oracle” button. It quickly provides the Tarot reading on the screen. It may generate cards from one to many, as this depends on the type of reading you’ve selected for your query. Yes/No Oracle: The purpose of this Oracle it to provide you a random answer, that might end up in your personal desires. Runes: It solves your questions and gives you suggestions in form of runic alphabets. I Ching: Here you just have to provide the question and automatically it will generate present and future predictions, giving you the meaning of each line. Google Chrome users can checkout Tarot.com to read your daily horoscope. Well! I find Tarot prediction interesting, as it gives me suggestions to broaden my spectrum for life and related problems. Other than relying on these website completely, you can try these websites to seek positive direction in life, which is good at times. Do try them and drop your feedback in the comments below. If you wish to learn about Feng Shui and Palmistry, then do checkout our reviews.